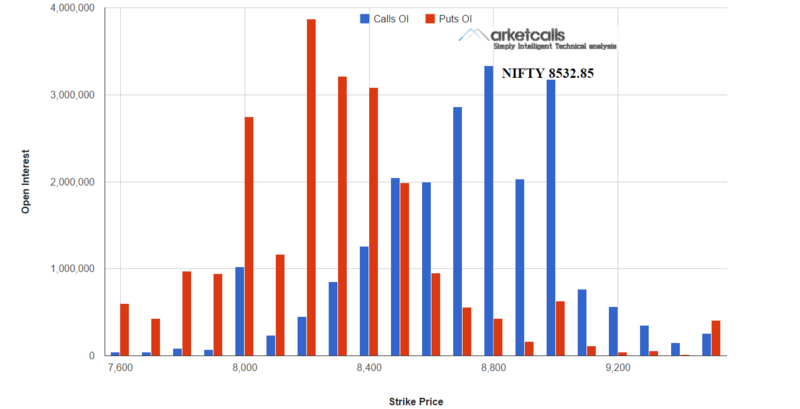 Daily Sentiment is Positive in Nifty futures and in Bank Nifty futures. However RBI policy announcement on 4th Aug will dictate the trend. Any Interest rate cut might induce negative sentiment in the markets. Net FII (FPI) investment in Equity market stood at 5,319 crore in July. It should be noted that FPI are net sellers and pulled 9112 crores from equity market during the month of May and June 2015. The Recent high in Nifty Futures (8664.75) and Bank Nifty Futures (19280) will be the near term resistance zone. Nifty Futures and Bank Nifty futures on the weekly charts trading below the 5EMA(high) and RSX turning down from the top suggests a possible sideways to downtrend movement on the weekly charts with the 5EMA(low) support zone 8336 and 18296. 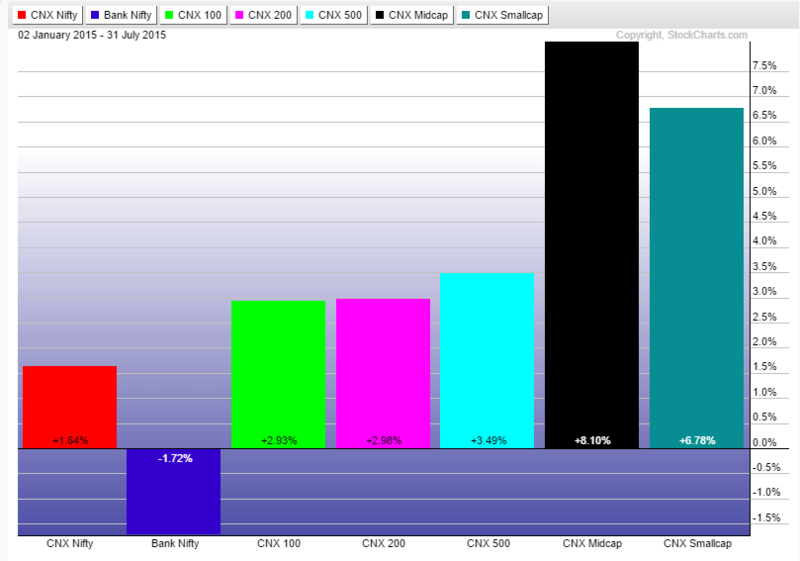 CNX Midcap and CNX Smallcap indices are the real outperformers during the month of july gained 4% and 6% respectively. Bank Nifty is the real laggard with YTD negative returns of -1.6% underperforming the benchmark index Nifty. Clearly Mid Caps are the top gainer with 8.1% returns Year to Date. RRG Study shows that the pharma and finance sectors could under perform nifty for sometime in the short run as it enters the lagging quadrant. 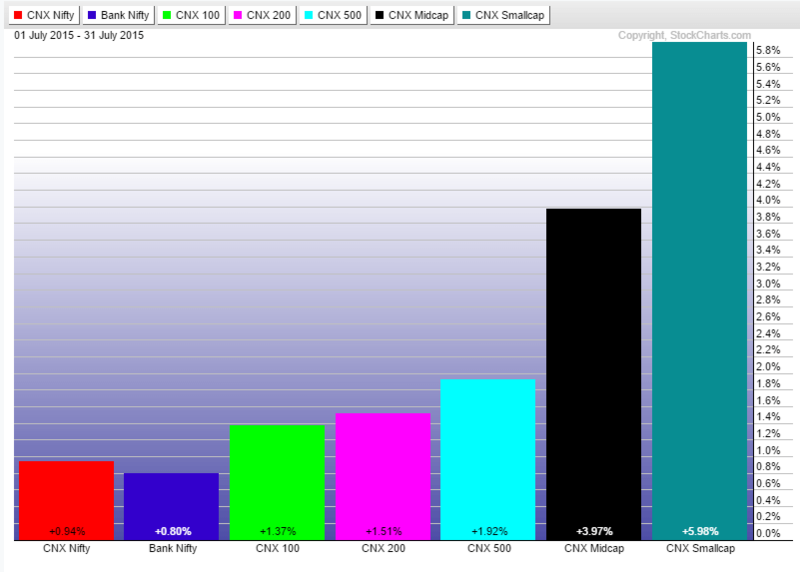 CNX Realty , CNX PSU though in the laggard quadrant looks for a rebound as JDK-RS momentum keeps increasing. 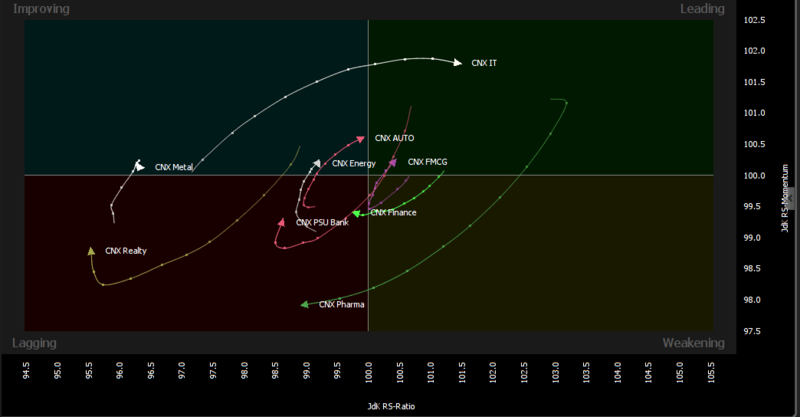 CNX-IT, CNX Auto, CNX Energy, CNX FMCG sectors could be the possible outperformers in the short term. There was a time when your website was very informative. Now it is only about how you can put the right keywords/charts in place to garner maximum traffic at your site. Dont try to monetize site to an extent where it loses its originality. This site was about Simple Technical Analysis. Now it has turned to something else. Please get back to what you were. We are not focusing on any kind of keyword optimization. We stopped taking lot about markets due to SEBI regulations. And so the focus is only on building Data Visualization tools, Meaningful Analytics and Useful tutorials for traders and speaking very less about the broader market.